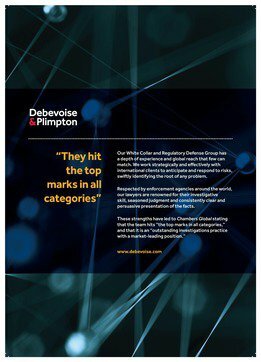 With its work for Keppel and Société Générale, over the past year Debevoise & Plimpton has bolstered its reputation as one of the world’s best firms for groundbreaking multilateral investigations and settlements. While competitors might brag about the number of former government officials in their ranks or cast themselves as the quintessential government insider firm, few can match Debevoise & Plimpton’s record over the last few years. As the Obama era wound to a close, top SEC and federal prosecutors flocked to the firm. From the SEC, the first was Andrew Ceresney, director of the agency’s enforcement division, who announced his return to Debevoise in January 2017. A month later, the firm secured the return of SEC chair Mary Jo White, whose tenure at the regulator attracted stinging criticism from Democratic Senator Elizabeth Warren in particular, for being too soft on banks. Both former Debevoise partners, White and Ceresney brought a third SEC official with them: Kara Brockmeyer, the longtime chief of the agency’s FCPA unit. The hiring spree continued into April that year, when the firm added Winston Paes, a top prosecutor at the US Attorney’s Office in Manhattan. And that’s only 2017. In 2016, the firm added Luke Dembosky, formerly the highest-ranking DOJ official focused on cybersecurity issues. And it recruited US District Judge John Gleeson, who retired from the Manhattan federal bench in March 2016. Gleeson is a former federal prosecutor known for his successful conviction of Gambino mob boss John Gotti. Such high-profile hires are only the latest chapter in the history of a white-collar group that has built its reputation upon the illustrious careers of its members. For White, the return to Debevoise represents her third stint at the firm, where she first worked as an associate from 1976 to 1978. She has led a distinguished career in public service since then, and remains the only woman to have served as US attorney in the nation’s most prestigious prosecuting office, located in the Southern District of New York. White was appointed chair of the SEC by President Barack Obama in 2013. But before that, she served as chair of Debevoise’s litigation department, presiding over a period of intense growth. Today, Debevoise’s investigations practice fields over 30 partners and counsel, including 10 nominees to Who’s Who Legal: Investigations and Who’s Who Legal: Business Crime Defence. It is the only firm that’s home to both a former US attorney general and a former UK attorney general. Michael Mukasey, who served as the top US prosecutor under President George W Bush, joined Debevoise in 2009. Lord Peter Goldsmith QC PC joined the firm’s London office after serving as the UK’s attorney general from 2001 to 2007. Goldsmith is nominated to Who’s Who Legal: Business Crime Defence. In New York, Bruce Yannett – a GIR editorial board member and nominee to Who’s Who Legal: Investigations and Who’s Who Legal: Business Crime Defence – leads the white-collar and regulatory defence practice. Yannett previously served as a federal prosecutor in Washington, DC. Also based in New York is Mary Beth Hogan, co-chair of the firm’s litigation department. Lord Goldsmith is joined in London by partner Karolos Seeger, another GIR editorial board member and a Who’s Who Legal: Investigations nominee. Other prominent figures around the globe include Thomas Schürrle, managing partner of the firm’s Frankfurt office, and Mark Johnson, a partner in Hong Kong who specialises in the Asia region. Both are ranked in Who’s Who Legal: Investigations. In June 2018, Debevoise saw the departure of New York partner Sean Hecker, who was counsel to Keppel Offshore & Marine in its $422 million resolution in December 2017 with the US, Brazil and Singapore, and to French bank Société Générale on its $585 million settlement in June with US and French authorities. He is now a named partner at New York boutique Kaplan Hecker & Fink. Meanwhile, international counsel Alex Parker, who was a GIR 40 under 40 nominee in 2017, left Debevoise in April 2018 to become head of special investigations at pharmaceutical company GlaxoSmithKline. Debevoise advised Société Générale on an investigation by the DOJ and France’s National Financial Prosecutor’s Office into allegations that the French bank bribed Libyan officials. In June 2018 it was announced that the bank had agreed the first-ever parallel US-France foreign bribery settlement. The bank entered into deferred prosecution agreements with prosecutors in the US and France, and to pay $585 million split between them, to resolve the allegations. A subsidiary of the bank also agreed to plead guilty in the US. Former New York partner Sean Hecker handled DOJ negotiations on behalf of the bank, along with a team from Skadden. In December 2017, Singapore-based oil rig builder Keppel Offshore & Marine agreed to pay US$422 million to authorities in Singapore, Brazil and the US to resolve allegations that it bribed Brazilian government officials. DC partner David O’Neil, together with Hecker, handled the US aspects of the settlement, which was the first coordinated FCPA resolution with an Asian country. The previous year, Seeger and Yannett brokered a high-profile global settlement for UK engineering company Rolls-Royce. After a four-year probe spanning the globe, authorities in the US, UK and Brazil announced in January 2017 an US$800 million settlement with the Rolls-Royce over allegations that the company paid bribes in multiple countries. The settlement included the UK’s third-ever deferred prosecution agreement. In the US, Rolls-Royce entered into a separate deferred prosecution agreement over FCPA conspiracy charges. Meanwhile, Yannett, Seeger and Eric Grosz represent oil company Royal Dutch Shell in corruption probes by the DOJ, SEC, SFO and authorities in the Netherlands and Italy, which relate to a US$1.3 billion oil exploration licence in Nigeria. Aspects of the case are on trial in Italy at the time of writing. Debevoise also represents former acting attorney general Sally Yates, who was fired after she refused to defend a presidential order by the Trump administration temporarily suspending the entry of refugees from seven majority Muslim countries. The firm advises Yates on US congressional probes into Russian interference in the 2016 presidential election. The firm also represents the Weinstein Company’s board of directors in allegations of improper conduct by Hollywood mogul Harvey Weinstein. Debevoise is based in New York City. It has offices in Washington, DC; Paris; London; Moscow; Frankfurt; Hong Kong; Shanghai; and Tokyo. Debevoise’s investigations team has had numerous household names among its clients including Twitter, Toyota and Home Depot. The firm also has a wealth of clients in the financial services industry. They include JPMorgan Chase, Federal Reserve Bank of New York, Deloitte and American Express. Pharmaceutical industry clients include Bristol-Myers Squibb and Merck. Debevoise has also represented Deutsche Telekom, News Corporation and Universal Music. In 2008, Siemens, the German manufacturing conglomerate, engaged Debevoise to conduct a multi-jurisdictional internal investigation into corrupt payments to foreign officials. Yannett led the investigation with assistance from Seeger in London. The case, which saw Siemens settle for US$800 million, was the largest ever US government FCPA enforcement action. The settlement heralded a new era of stepped-up US foreign bribery enforcement and increased international cooperation between government authorities in the US and Germany. Since then, the firm has been involved in a number of other FCPA settlements. It helped Oregon defence contractor FLIR Systems reach a US$9.5 million settlement with the SEC. It represented Deutsche Telekom, a telecommunications company, in an FCPA probe centered on a Hungarian subsidi­ary, which resulted in a US$95 million settlement with the DOJ and SEC. It also advised manufacturing business 3M Company in an FCPA case before the DOJ and the SEC, which resulted in a dual declination. Among Debevoise’s highest-profile clients is Toyota, which has recently faced some of the greatest regulatory scrutiny in the company’s history. The firm represented the Japanese car manufacturer in relation to US state and federal investigations, which focused on safety issues relating to vehicle acceleration. In March 2014, Toyota entered into a deferred prosecution agreement with the DOJ, paying US$1.2 billion and agreeing to appoint an independent monitor to oversee its safety practices. Debevoise & Plimpton LLP is a premier law firm with market-leading practices, a global perspective and strong New York roots. Approximately 650 lawyers work in nine offices across three continents, within integrated global practices, serving clients around the world. The firm’s white-collar and regulatory defence group excels in high-profile, complex representations for clients facing corporate crises. The group’s depth of experience and global reach means it works strategically and effectively with international clients to anticipate and respond to risks, swiftly identifying the root of any problem. The team’s expertise includes defending against criminal prosecutions and civil enforcement actions, securities related litigation, conducting internal investigations, negotiating complex global settlements, and facilitating cooperation with government regulators. The team also routinely counsels clients regarding preventive measures, compliance programmes and the collateral consequences of criminal proceedings. Respected by enforcement agencies, the group’s lawyers are renowned for their investigative skill, seasoned judgement and consistently clear and persuasive presentation of the facts. This makes the team a powerful advocate for clients and leads to considerable success in matters involving investigations by the SEC, the US Department of Justice, the New York Attorney General, the UK Serious Fraud Office and other authorities around the world. The group is made up of highly experienced partners in New York, London, Paris, Frankfurt, Shanghai, Moscow, Hong Kong, and Washington, DC. It is one of the few in the market to have exceptional capabilities across geographies. Debevoise is the only firm that Chambers & Partners ranks in Band 1 for corporate crime and investigations in both the UK and the US. The team is made up of highly experienced career defence lawyers, as well as former federal prosecutors and regulators. The group combines this unique understanding of the enforcement landscape with a deep appreciation for client business issues. As leading trial lawyers, but skilled negotiators, a successful outcome for the client is frequently achieved before a trial begins, and government cases are sometimes dropped altogether. The practice also tailors its solutions, placing an emphasis on flexibility and knowing when to shift gears and adapt to best meet the needs of each unique circumstance. Capabilities are scaled to match the size of any challenge, and adjusted as a case progresses.